Seafood Paradise 2 Plus Fishing Game Full Game Board Kit is an advanced version fish hunter video game from Seafood paradise series game, plays exciting fish hunter game play to catch as many and more profitable fish as possible to win points for the biggest payout, this game board kit is currently used as an upgrade Seafood Paradise 2 and will fit in the 6 or 8 player arcade machines currently available, operators simply need to adjust the number of players on the game board itself. This allows operators more variety from a single board. 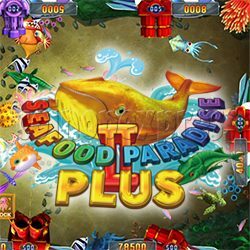 Seafood paradise 2 plus version comes with the same as the previous Seafood paradise 2 games. * increase in activation function. You can active the profitable scores by factory default setting, after reaching, you need to enter an activation code. As with marketing.